Chronic exposure to arsenic (As) causes significant human health effects, including various cancers and skin disorders. Naturally elevated concentrations of As have been detected in the groundwater of Bangladesh. Dietary intake and drinking water are the major routes of As exposure for humans. The objectives of this study were to measure As concentrations in rice grain collected from households in As-affected villages of Bangladesh where groundwater is used for agricultural irrigation and to estimate the daily intake of As consumed by the villagers from rice. The median and mean total As contents in 214 rice grain samples were 131 and 143 μg/kg, respectively, with a range of 2–557 μg/kg (dry weight, dw). 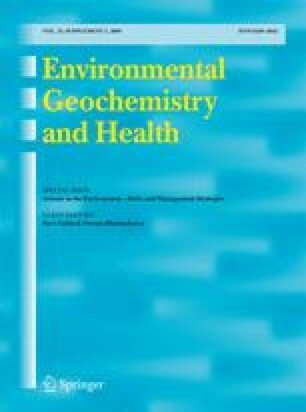 Arsenic concentrations in control rice samples imported from Pakistan and India and on sale in Australian supermarkets were significantly lower (p < 0.001) than in rice from contaminated areas. Daily dietary intake of As from rice was 56.4 μg for adults (males and females) while the total daily intake of As from rice and from drinking water was 888.4 and 706.4 μg for adult males and adult females, respectively. From our study, it appears that the villagers are consuming a significant amount of As from rice and drinking water. The results suggest that the communities in the villages studied are potentially at risk of suffering from arsenic-related diseases. We thank the field workers of Dhaka Community Hospital, Dhaka, Bangladesh, for their extensive help and cooperation during field sampling in our study areas. The authors gratefully acknowledge the assistance provided by Ms. Tunde Heinrich for digestion of the rice samples. Financial support from AusAID is acknowledged with appreciation. WHO. (2001). Fact Sheet 210. As in drinking water. http://who.int/mediacentre/factsheets/fs210/en/.